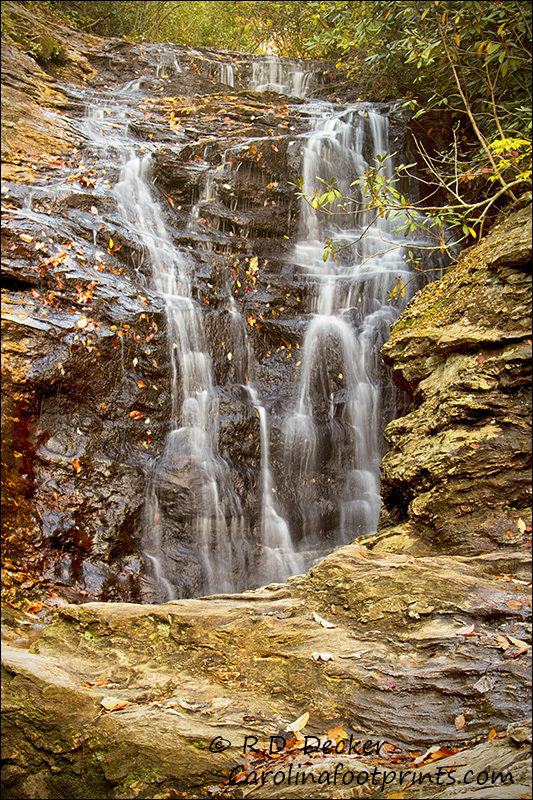 Within the boundaries of Hanging Rock State Park are 5 “advertised” waterfalls. 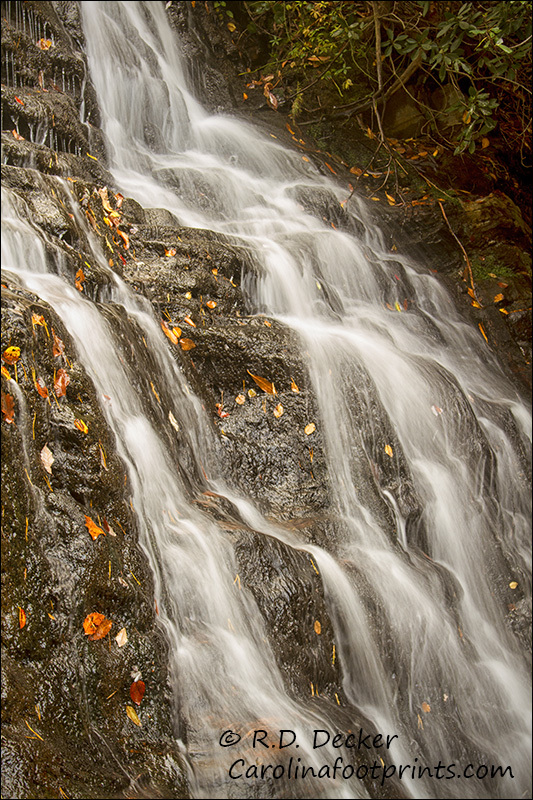 (Rumor has it that there are other falls not found along the marked trails.) Upper Cascades is the shortest hike from the main parking lot and is certainly a pretty natural feature. For the video I used a combination of footage from my Canon 7D DSLR and my SJCam SJ 4000 action camera. All still photos were taken with the 7D. 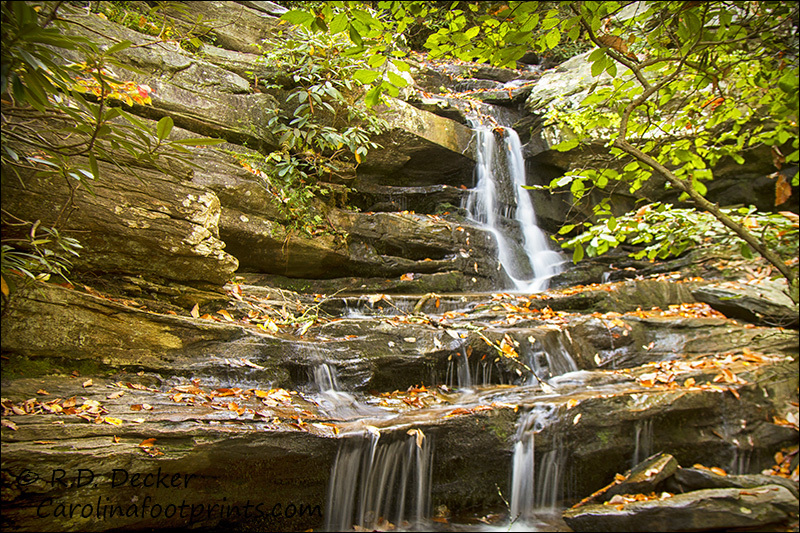 Hanging Rock State Park is located near Danbury in the northwestern part of North Carolina. 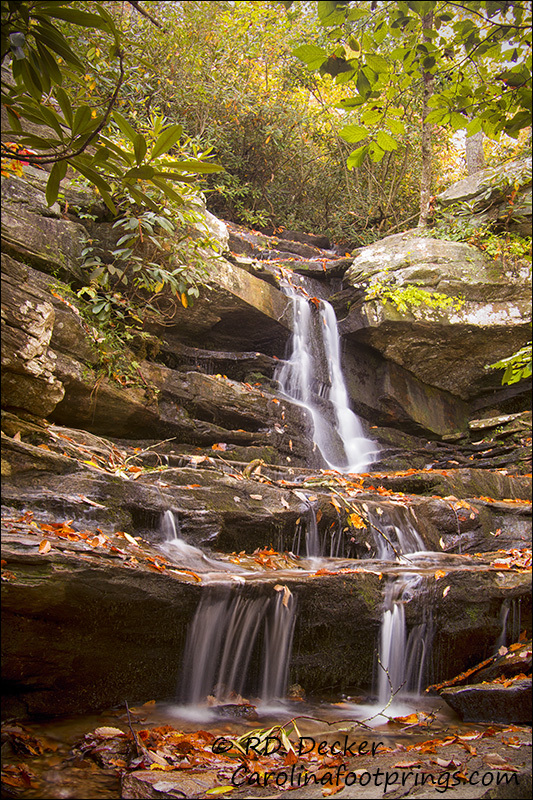 Nestled in the Sauratown Mountains, the park is home to several waterfalls. While not the tallest falls in the state, they are certainly pretty. 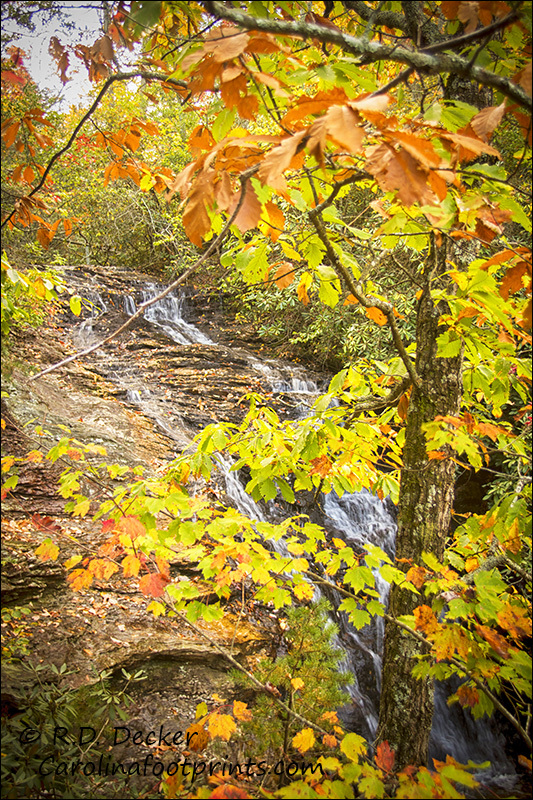 Unlike so many waterfalls that require miles of hiking to reach, the well known falls of Hanging Rock State Park are all short hikes from convenient parking lots. In addition to the five publicized waterfalls, my understanding is that there are a few other falls hidden away and requiring a bit of effort and adventure to find. 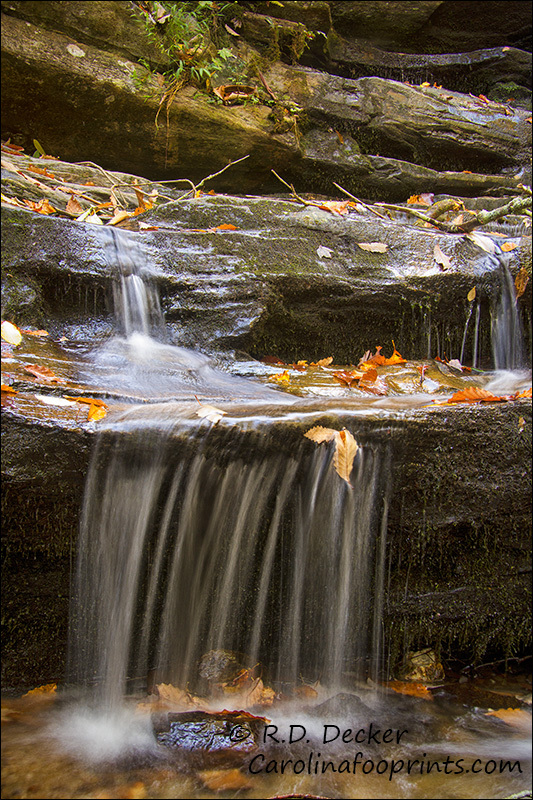 The following are a few photos and a video of Hidden Falls. All photos were taken with a Canon 7D. The video is a combination of footage from the 7D and from my SJCam SJ 4000 action camera. 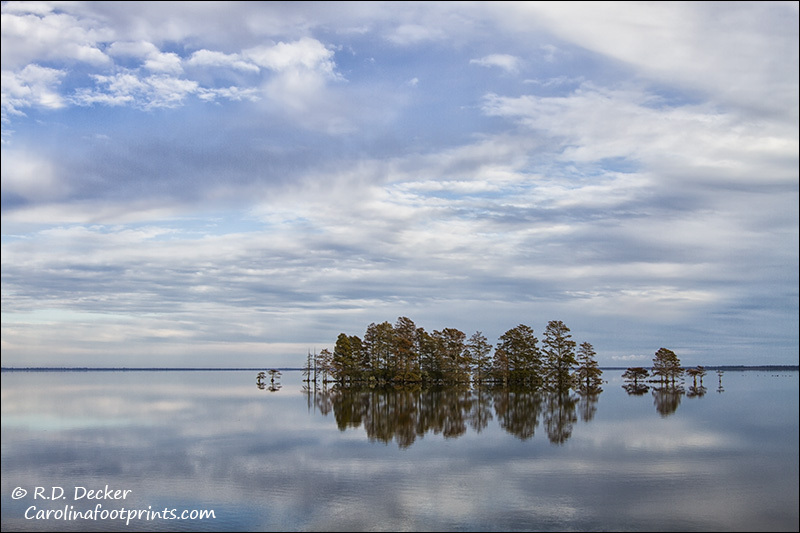 I took a drive up the coast a while back and while up that way I paid a visit to Lake Matamuskeet National Wildlife Refuge. While I was basically just doing a quick scouting trip on my way back home, I stopped along the causeway to take a couple shots. 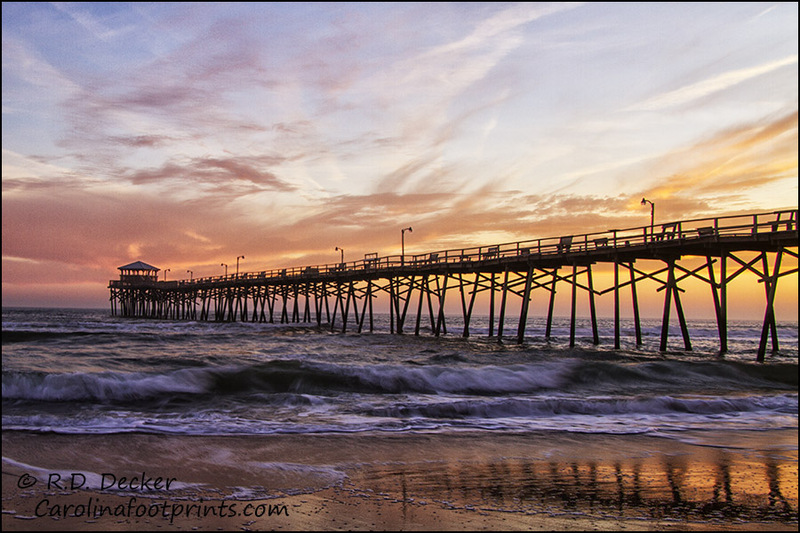 If you’ve looked a many North Carolina landscape photos you’ve likely seen this view several times. Even though I knew it was one of those locations that has been photographed to the point of saturation, the mirror like water combined with the lovely sky was just too picturesque to pass by. Below are my interpretation of this classic North Carolina scene. 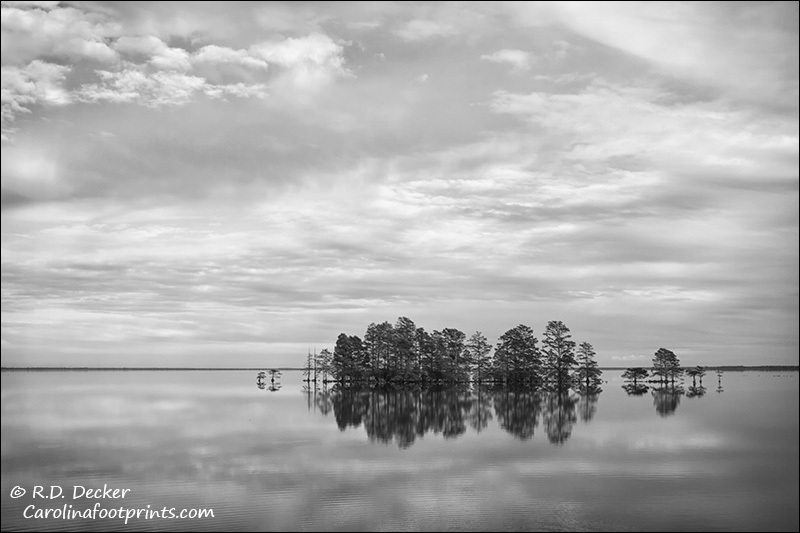 Lake Mattamuskeet in Black and White. When I visit my favorite photography areas I usually do a bit of scouting after I’ve made the shots I planned for. Last winter I came across a fox den while scouting. I made some mental notes of the location with plans to revisit it in the spring. 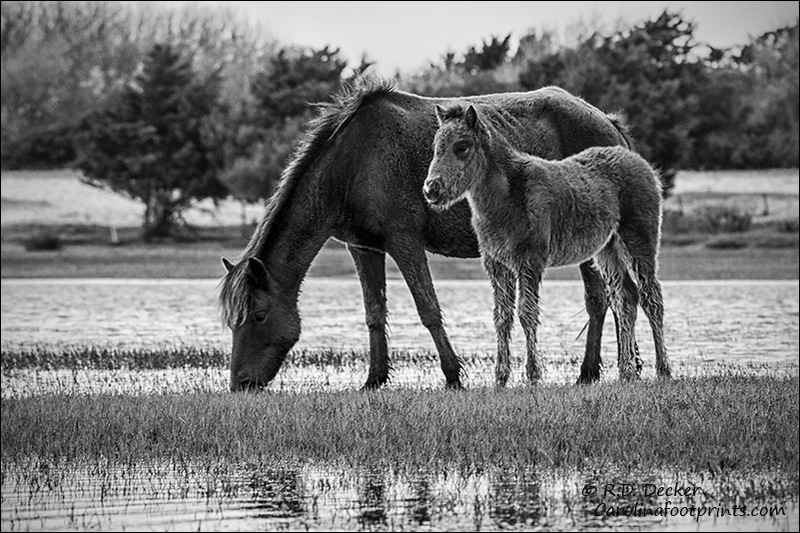 A few evenings ago I was photographing wild horses. The horses were being less than animated and, honestly, I already have thousands of images of wild horses with their heads down feeding. The clouds in the sky weren’t overly interesting and I didn’t see the prospect for good sunset shots being very high either. With those considerations in mind I decided to call it an evening and head back to my kayak. However, I thought I’d go a bit out of my way and see if there was any sign of activity around the fox den. Activity there was! As I slowly and quietly moved into a position where I could get a peak at the fox den I noticed the outline of a hear with pointy little ears through the tall glass. Not only was it an active den the kits were outside! The problem was from my location I didn’t have a clear view of the den. The den was hidden behind tall grass. To make matters work the sun was directly behind the den. The only chance I’d have to get a shot would require repositioning myself for a view of the den. 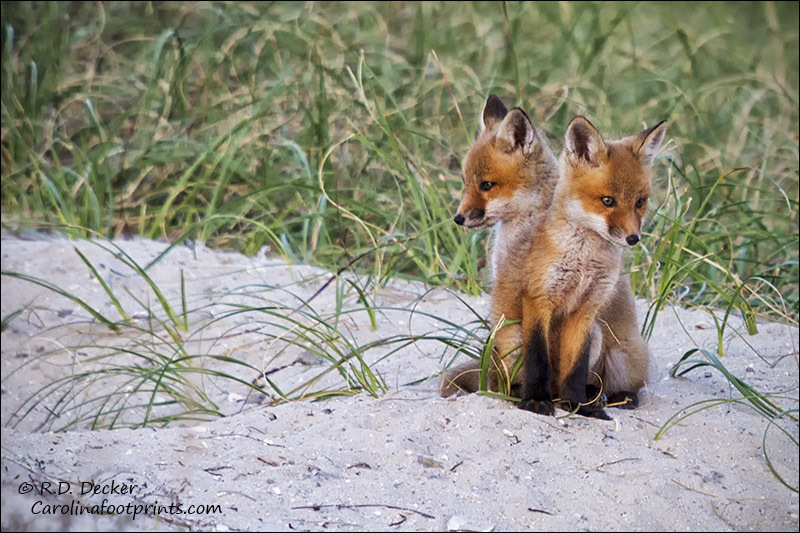 Now foxes have a reputation for being shy, evasive animals. In my experience it’s an accurate reputation. 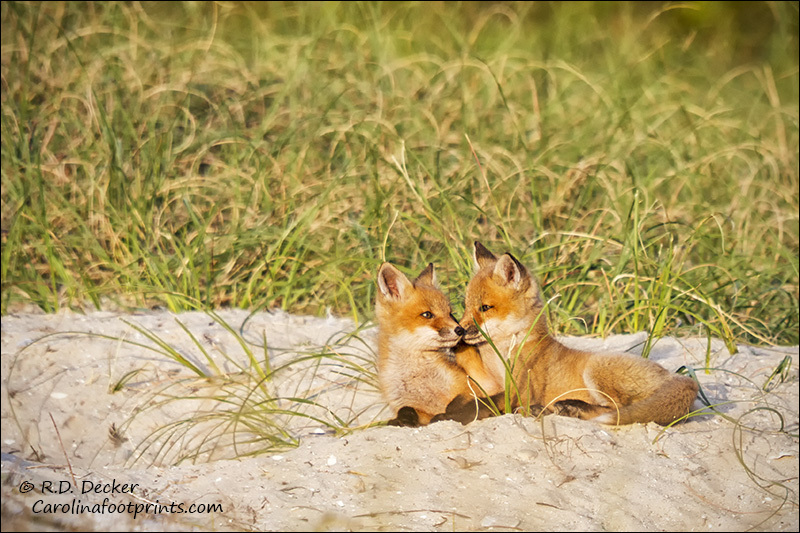 In order to get a shot I’d have to move into a position where there was no cover and do so without spooking the little foxes. I figured my odds were low but I just had to give it a try. First I noted the wind direction and plotted a course that would keep me down wind of the den. 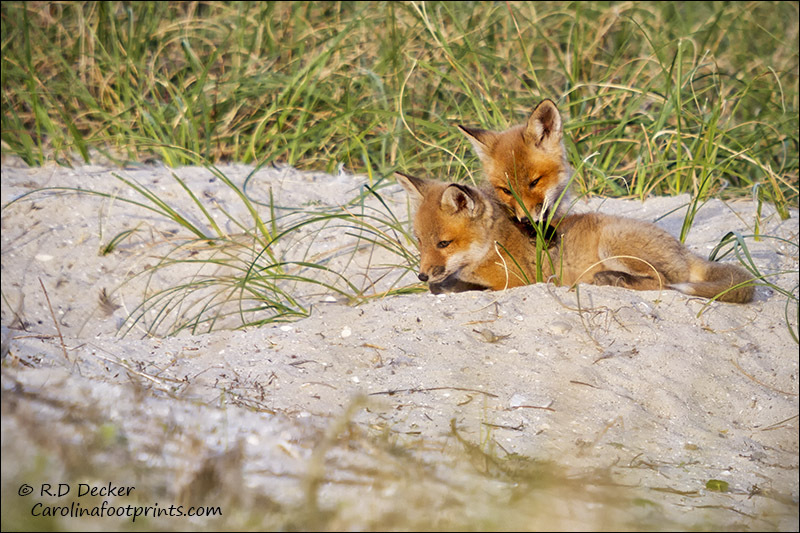 I looked at the route and could see that I would be out of view of the foxes… unless they moved up on top of the dune above their den. 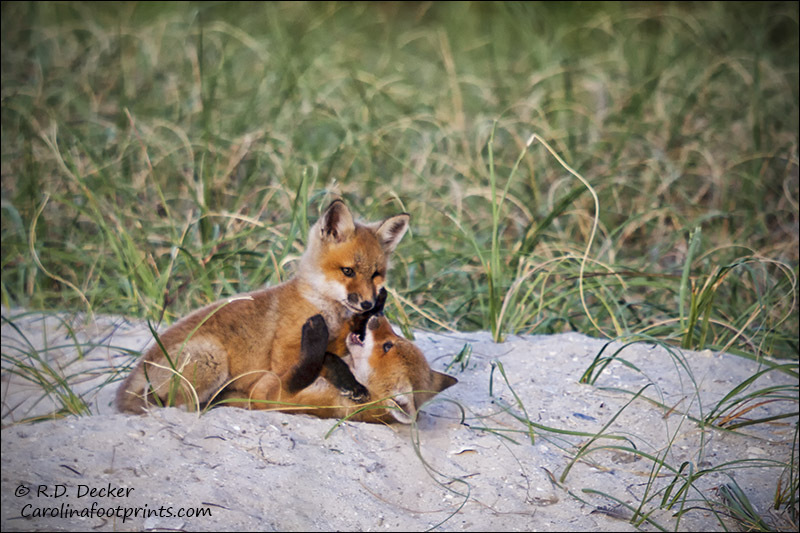 I set a goal of the to of a small dune about 150 or 200 feet from the den that would give me a clear view of the foxes. Upon reaching the spot I was a bit surprised to see the foxes were still outside the den. One stared intently at me as I sat very, very still. After what seemed like a long, cold stare the little mammal went back to business. For the next forty-five minutes to an hour I’d take a few shots, push my tripod and camera a foot or so in front of me, scoot up behind it and take a few more shots. Slowly I inched closer and closer to the kits. I managed to work within about one-hundred feet of the little guys before that light became too dim to shoot. I’m a little surprised that I was able to get that close to these wild animals. I wasn’t inside a blind nor was I wearing camo. 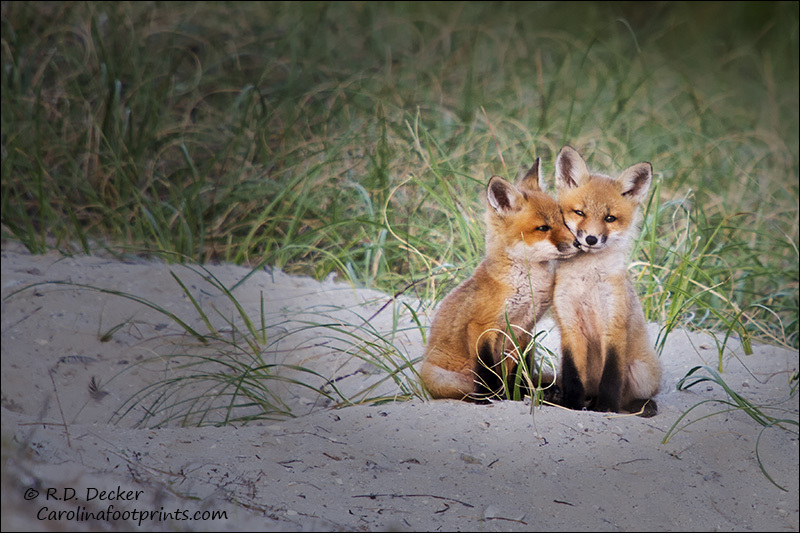 My clothes were earth tones but foxes, like other canidae, are color blind. The two things I had working in my favor was wind direction and the fact that the sun was directly behind me. Try looking directly into a low, setting sun and you’ll understand how difficult that can make things. I’ll check these images up to a small dose of apply field skills and a big helping of luck. Mother nature has been fairly cruel to me this year. If I have a personal day to make photo the weather is likely to either be wet, threatening or severely overcast. Today was no exception. 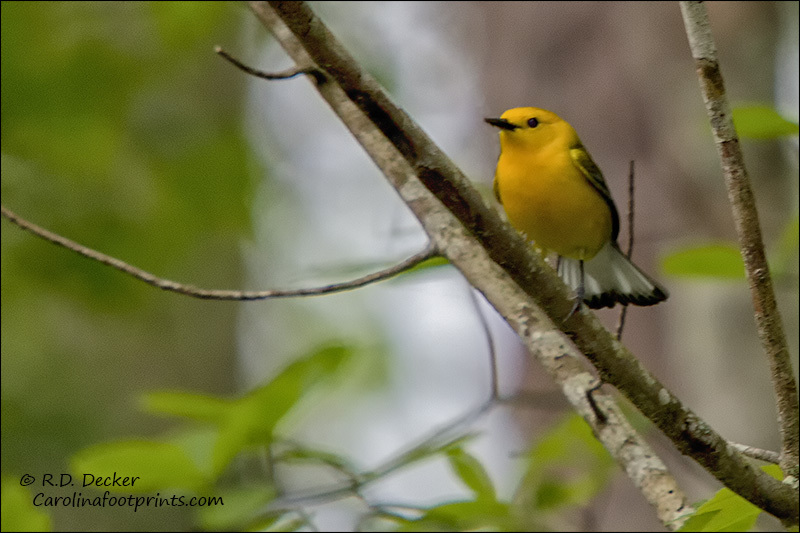 I got up with plans to either visit the wild horses or to kayak up Cahooque Creek for some Prothonotary Warbler photographer. Neither seemed a good idea. Rather than being totally stymied I decided to take the jeep and drive to a location I know has some potential for warbler photography. With the sky overcast and the forest dark and thick I knew I wouldn’t be thrilled with the settings I’d have to use, but any image was better than no image. I was treated to observing a Black & White warbler, but he stayed too deep in the woods for a shot. 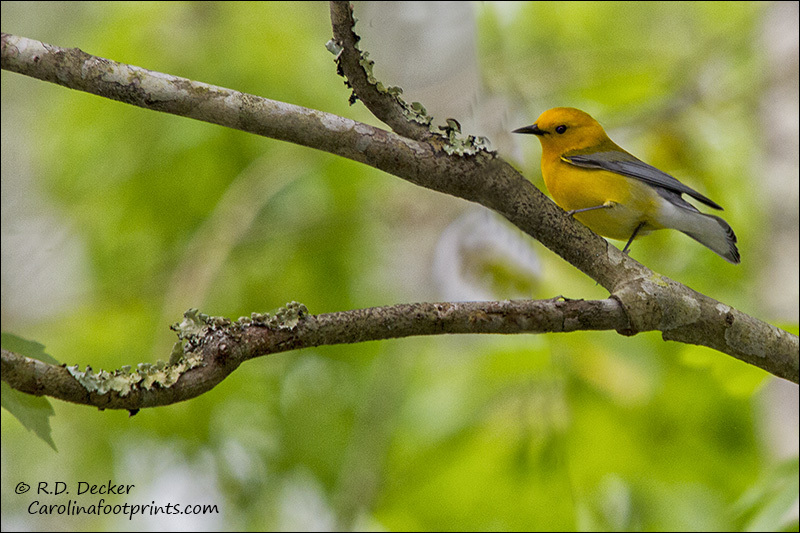 I also got several looks at some Prothonotary Warblers and was lucky enough to get a couple of okay shots. Handheld, high ISO certainly didn’t combine for an image outstanding, but at least I got a couple shots. Because of the need to manage the herd size new additions are always a very special event. The births of new foals are few and far between. 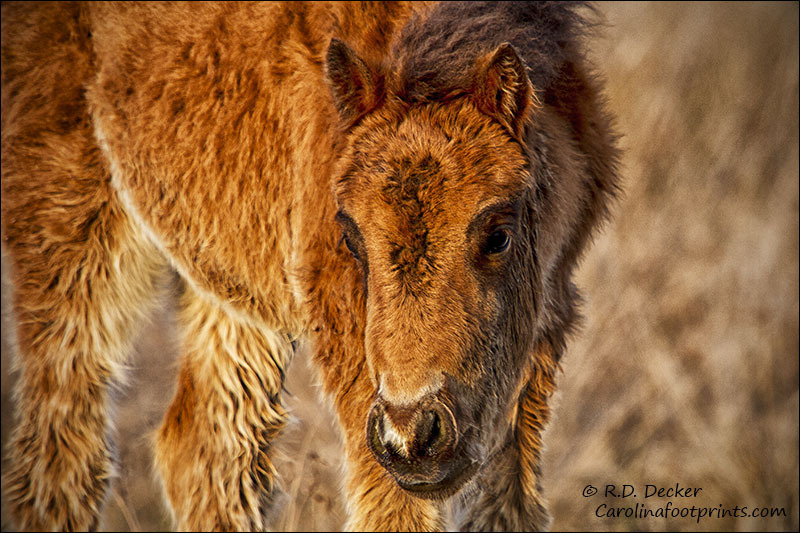 Born a few months ago, this little horse took his first few breaths as Mother Nature shared cold, snow and ice with Coastal Carolina. What a shock it must’ve been to trade the warmth of his mother’s womb for that icy cold winter world. During my first few trips to the reserve with the hope of finding and photographing him I had no luck. His mother was doing a good job of keeping him secluded from my camera and lens. 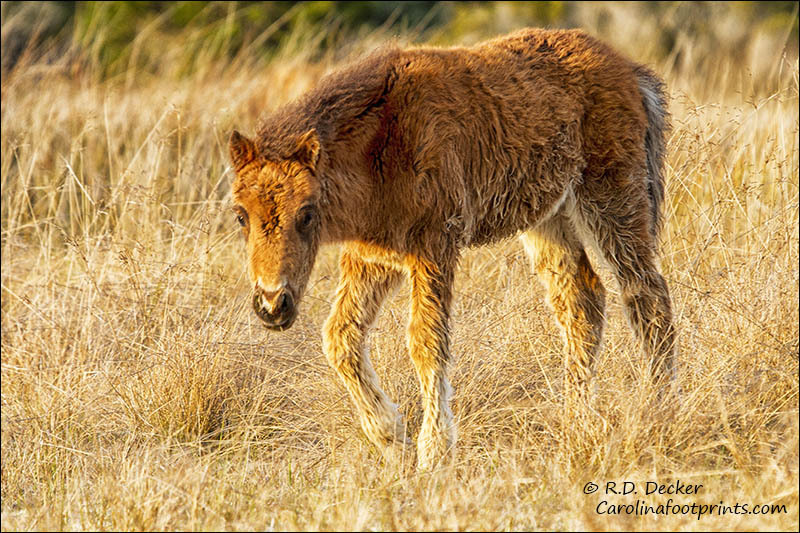 As spring began to reach the reserve the horses started falling back into their warm weather routines and that included moving this young foal into more obvious locations. While guiding a group of equine artists from Virginia we were treated with an afternoon and evening of foal watching. With no further introduction I give you “Skipper,” the reserve’s newest resident. I had the pleasure of introducing a few members of the Virginia Equine Artists Association (VEAA) to the wild horses of the Rachel Carson Estuarine Reserve yesterday. As sunset neared most of the herd had moved out onto Bird Shoal. While many of the horses had moved a hundred or so yards out onto a sand flats area, a few stayed back near some low dunes. I decided to stay back with the smaller group of animals while most of the group photographed the larger group of horses. I hang back in part to stay out of the way of the people I was guiding, but also because there was an image I’ve had in my mind for quite some time that I hoped might develop. As it were, this was the evening that opportunity was going to happen. I watched as the sun sank lower in the sky, resting just above the top of a small sand dune. In my mind I was urging the horse nearest that dune to walk on top of it. “Please go up there” I thought. 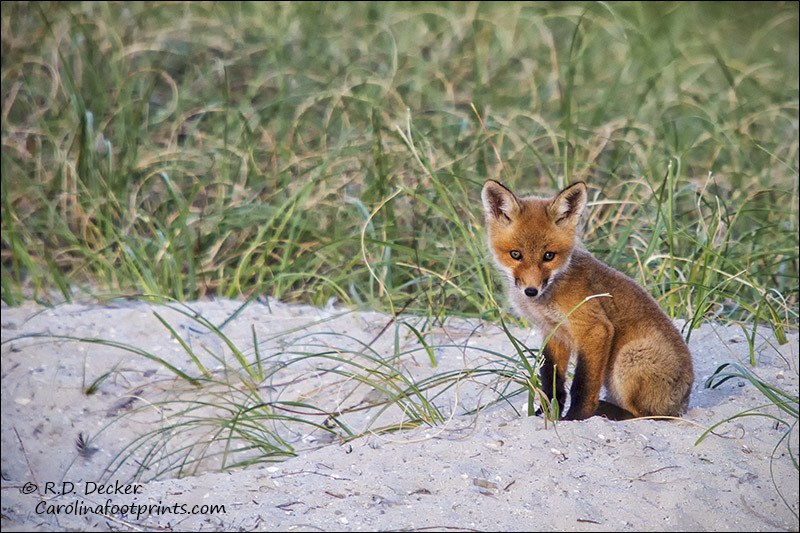 “Ease up on top of that dune, please!” Then, just as if this beautiful animal could read my mind, up the dune it went. Stopping between my lens and the setting sun. 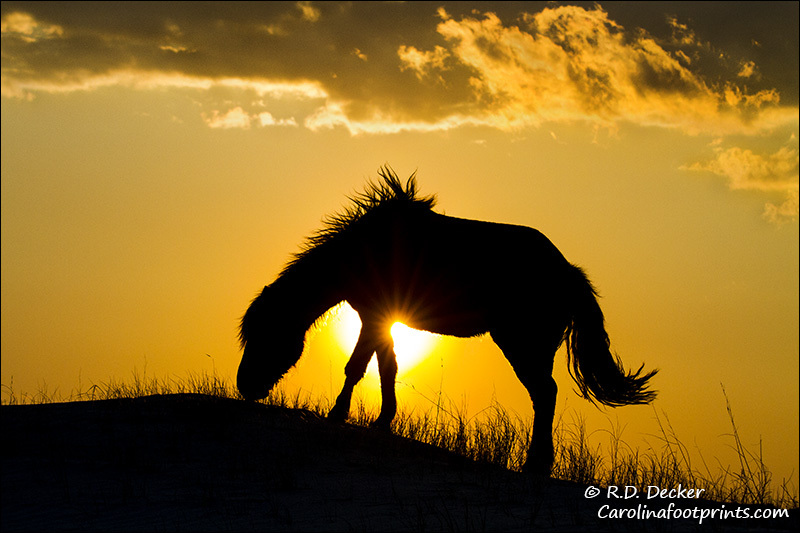 A few clicks of the camera and then the horse moved over the crest of the dune and out of sight of my camera. It is the moments like these that make time spent in the field worth the effort. I hope the folks from VEAA enjoyed their visit. If you like to learn more about their organization visit the Virgina Equine Artists Association website. Also I’d like to give a quick thank you to Captain Monty of Seavisions Charters and Ecotours for another perfect experience on the water. As photographers most of us have had the “rule of thirds” beaten into our artistically thick skulls. So thoroughly is this concept drilled into us that we frequently miss other wonderful compositional opportunities. One compositional concept that is frequently overlooked as to do with repetition. 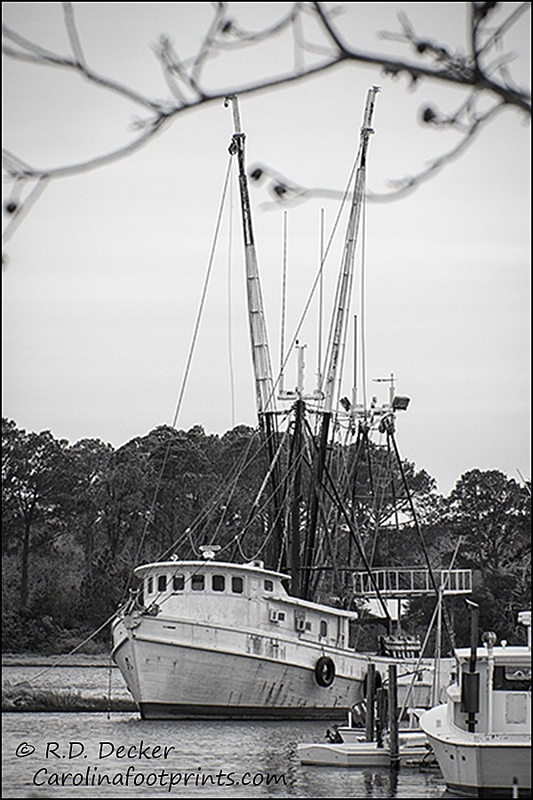 Repeating shapes or objects can be a strong compositional tool. Sometimes repetition will allow and otherwise mundane subject to be an interesting image. Combine repetition with other compositional concepts such as the use of lines and diagonals to help strengthen the impact of such images. 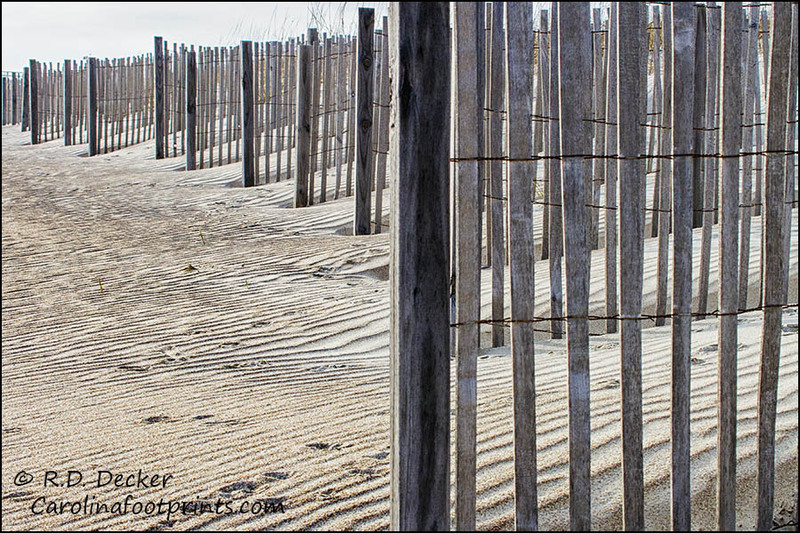 Below are a couple recent images of a sand fence found along the coast of North Carolina. Honestly there’s nothing glamorous about this subject. 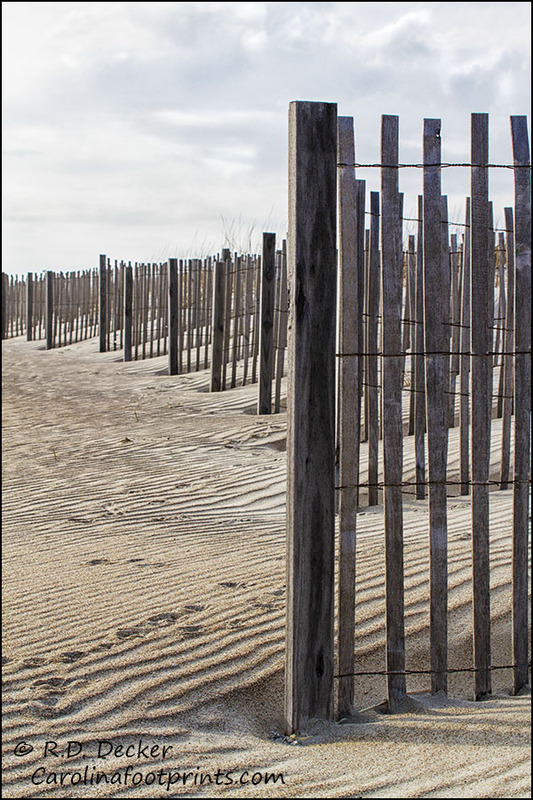 As subject matter goes a sand fence is not colorful, rare, or particularly beautiful. Yet they can be an interesting subject. What these photos have going for them, at least in my mind, is the repetitious pattern created by the fence combined with the stark contrast of light and dark plus the strength of lines. Take a look and see what you think. I’m willing to admit it. I have a prejudice against sunrise and sunset photos. It’s not that dawn and dusk are beautiful times of the day. They most certainly are. My prejudice isn’t about a lack of beauty, it’s the result of some ideas that were put into my head many years ago. Honestly I don’t really recall when it started but I do remember some of the circumstances that created it. I don’t recall if it was an article in a magazine, or a paragraph in a photography book, but some where along the line I read something about how “cliche” photos of sunsets and sunrises are. In general the author was suggesting that the odds were against you if you were trying to place those types of photos with a stock agency… that the market was saturated with images of the sun setting and rising. For some reason that suggestion stuck with me. I vaguely remember reading other articles talking about how sunrise and sunsets are simply too easy to photograph. The idea was planted in my mind that it’s almost impossible to take a bad sunrise or sunset photo. Ever since reading those words, having those concepts placed in my mind, I’ve struggled with photographing these wonderfully colorful scenes. When I talk about struggling with making these types of images I don’t mean with things such as technique and composition, but with generating the mental motivation to take those kinds of shots. I almost feel guilty when I make photos of the sun rising or setting over a pleasant scene. I’ve been brainwashed into the belief that these shots are just too easy. That’s really not true. All sunrise-sunset images are not created equally. There are a few photographers I know of that are brilliant and finding locations and setting up compositions at dawn and dusk. All of these images are not equal. This is a fact I have to keep reminding myself. You may have noticed over the last year or so that I’ve posted a few sunrise and sunset shots. I’m trying to beat that prejudice and allow myself the joy of photographing these beautiful, daily events. Below is a recent effort. Following the big snow at the end of January I ventured out in search of some interesting snowscapes to photograph. 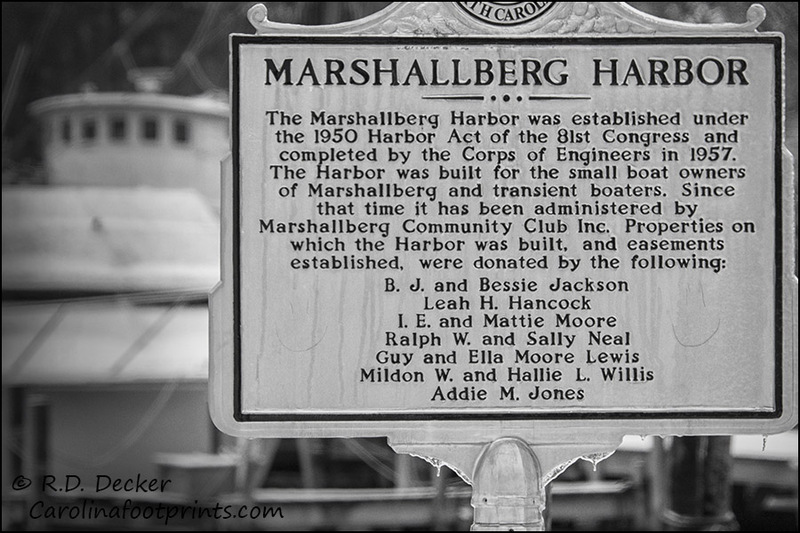 My explorations included a trip to the downeast community of Marshallberg, NC. 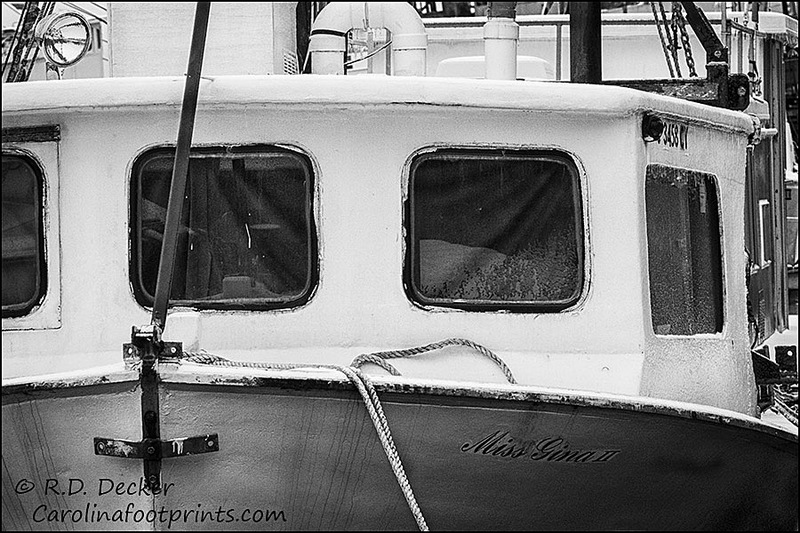 While I was there I took a few minutes to photographically explore the boats moored in the Marshallberg community harbor. From the viewpoint of images depicting the rare coastal snow storm these shots really don’t work. But from a historical/Americana perspective I think they’re kind of interesting. 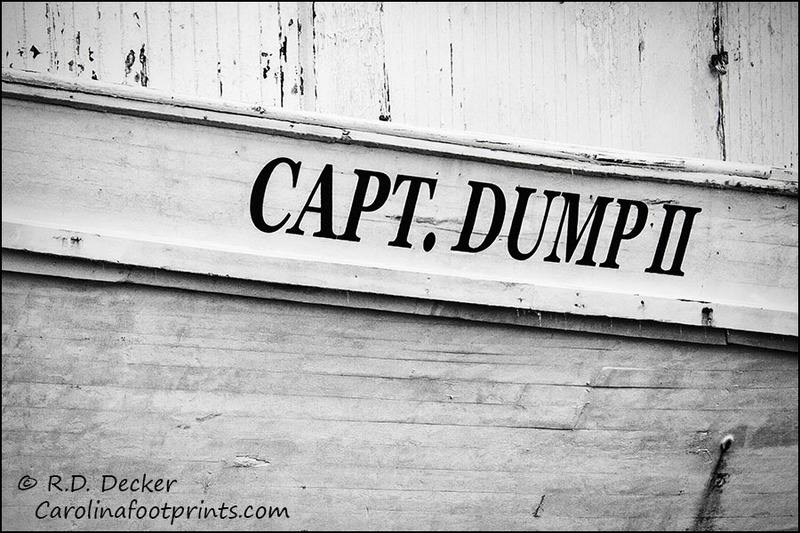 Considering the primary subjects were wood construction boats, and the primary color of the boats being white, I felt black & white was a better choice than color for these images. 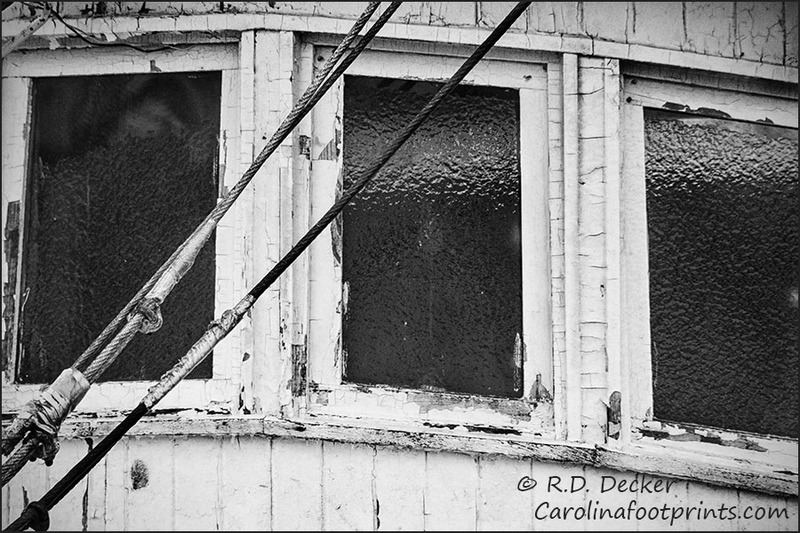 While these shots aren’t really nature related, I think they fit in well with the “adventures in and around the Carolinas” theme.